Spring is here and most people are ready to shed any weight they may have gained through the winter. To get your body beach-ready, it is important to start spring fitness with a realistic approach. The first thing to remember is to find a healthy balance between your physical activity level and your food choices that work with your lifestyle. Your physical activity must include doing something you love so that you will be consistent and continue to do it for the long term. And when it comes to your food intake, remember to eat everything in moderation and choose a sensible diet that has enough substance that you will feel satisfied. Diets that are very low in calories (less than 1200 calories per day) are very hard to sustain for more than a few days. Don’t become obsessed with the scale. It can be discouraging to see the scale go up a little or not move at all after you feel like you have made a lot of sacrifices. However, your weight will likely fluctuate over short periods of time due to water weight, muscle gain, or salty foods. Instead, weigh yourself once every week or so– this way the scale will not control your emotions. Be realistic: Losing weight is not an overnight venture and hence you have to set realistic expectations. In most cases, the immediate weight loss is only due to water- the real weight loss usually starts to occur after 14 days of consistent exercise and proper nutrition. Stay consistent: The road to successful spring fitness must include consistency. You will not lose weight if you just work out once a week and then take a break for a week. You will need to be consistent in your exercise regimen which means working out at least 4-5 days a week and at a minimum 20 minutes each day if possible. It is okay to miss a day or two once in a while and you should not feel guilty about it. If you need to break your daily exercise sessions up into shorter sessions in order to fit them in, go for it. Choose the right type and amount of exercise. You may think that you can only be successful you lift weights, include intense aerobic or use the latest exercise machines. There is no evidence that one type of exercise is better than another. If you are just starting out, walking is as good an exercise as any. But you should try to walk at least 30 minutes most days of the week. This can amount to a loss of a few hundred calories every day, which could add up to a couple of thousand calories in one week. At the end of the month, you could lose 2 pounds and by the time spring is over, you could lose 8-10 pounds. The advantages of walking is that it is free, it allows you to enjoy nature, feel better, and the exercise is free of complications. Eat right: No matter what type of exercise you choose, you still need to make good food choices. There is no specific eating plan that works better than another, since we are all different– however, if you simply use a common sense approach, you can eat everything in moderation. A general rule of thumb is this: For males, the total calorie count should not be more than about 2500 a day and for females the calorie count should not be much more than 2000 calories and of course less if you would like to lose weight. Eat a diet that is rich in fruits, veggies, nuts, whole grains, lean protein, and try to limit the intake of red meat and saturated foods, caffeine, soda and alcohol Of course, the best beverage is water- it can quench your thirst, does not stain your teeth and has no calories. Join the club! If you are the type of person who is not able to exercise alone at home, then join an exercise club or gym. There are many gyms all over the country and they offer a range of exercises, machines, weight lifting equipment, sauna, racquet ball games, and you will always find someone that shares your goals. Rest. Do not over train as this only leads to fatigue and a dislike for the exercise. Focus on the quality of exercise as well as the quantity. You should give the body enough time to rest and recover. Remember, always stretch for 5-10 minutes before and after starting any exercise. This will help prevent injuries. Find a friend. The majority of people who accomplish their goals do so when they undertake exercise with the company of others. Mutual friends can help motivate and support each other when you get bored with a certain exercise or become unmotivated. 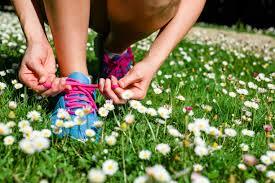 We can all improve on our level of fitness and spring is a great time to start something new. Start a new walking program, grab a friend or join a gym to help you stay motivated. And of course there is always an option to get help from a professional trainer if you just can’t seem to get started or keep going. 1 Response to "Spring into Fitness!" Thanks for sharing such an informative post. You have described all the things in detail about exercises and food. All the other posts on site are very helpful.